PORT-AU-PRINCE, Haiti — Two-thirds of Haiti’s presidential candidates said Sunday’s election was so tainted by fraud that it should be invalidated, but late in the evening, national election officials ordered the vote to stand, saying that problems at most polling sites had been minor. “Only 3.5 percent of the voting centers had trouble, that’s not enough to ruin the election,” said the national election council president, Gaillot Dorsainvil. He said that ballots had been damaged or destroyed at 56 centers and that people who had cast ballots there would be allowed to revote. It was a day of contrasts for voters in Haiti’s first election since the January earthquake — excitement and exasperation, accusations and denials of efforts to rig the results. In a country still reeling from the devastating quake, a day that began mainly with delays ended in conflict. At an afternoon news conference here, 12 of the 18 candidates still in the race had called on the election council to void the results because of “massive fraud,” which they described as an effort by the Unity Party of President René Préval to stuff ballot boxes and turn away voters who opposed Mr. Préval’s chosen candidate, Jude Célestin. The candidates, in an unusual display of unity before dozens of chanting supporters, urged their partisans to peacefully take to the streets, and many did. A meeting among the protesting political parties was planned for Monday in the hope of finding a solution that would steer the country away from this latest political turmoil. But such unity rarely emerges from conflict here, where elections have frequently been marred by chaos. While Sunday appeared less violent than past election days, the path forward seemed as murky as the garbage-filled canals here. Preliminary results were not expected to be released until Dec. 7, leaving candidates time to trade attacks and claims of victory or unjust defeat. A round of expected demonstrations began immediately after the news conference, when supporters of at least two candidates, Charles Henri Baker and Michel Martelly, a popular singer known as Sweet Micky, marched to the national election council offices. Meanwhile, the international community that had invested millions of dollars and sent hundreds of people to help the government plan and run the election, reacted with caution to the fraud accusations and the election council’s response. A spokesman for the United States Embassy, which spent $14 million in election preparation, said only that it was monitoring the situation. Representatives of theOrganization of American States and the Caribbean Community, which had sent a team of observers, canceled a news conference and later issued a statement saying it was gathering information for “our assessment of polling day activities.” The United Nations, which had given logistical and security help, said Sunday night that it had “deep concerns over the numerous incidents that marred the election,” and that any deterioration in security could have “dramatic consequences” on the response to the cholera epidemic Haiti has struggled with for a month. Mr. Préval’s office did not respond to requests for comment. Several voting centers appeared organized and calm, with Haitians of all ages lining up patiently and placing folded paper ballots resembling colorful place mats with pictures of the candidates to aid illiterate voters in plastic bins. But at many other polling places anger rose, as voters complained of being turned away. In many cases, tension started with delays in opening voting sites at 6 a.m. In some places, election workers were still struggling with voter lists four hours later, and with mollifying so-called monitors hired by political parties to oversee the vote. Some international observers expressed concern about poor planning and low turnout. “Badly organized,” was how one United Nations observer characterized a polling site near Cité Soleil where voting materials had not been delivered hours after polls opened. Some problems were expected. Less than half of the more than 400,000 new and replacement national identification cards required for voting were thought to have been distributed by Sunday, leaving hundreds of thousands of people frustrated before the day began. But there were also cases that were harder to explain. Outside a voting center in Pétionville, a wealthier suburb now filled with makeshift camps, young men waved their national ID cards at the police as they complained to reporters of being denied a chance to vote. Inside, among the various classrooms filled with election workers, the struggle of Sultane Lubin was common. Ms. Lubin appeared just after 10 a.m. on the second floor, wearing a cheerful peach suit that contrasted sharply with the anger she directed at anyone who looked official. “I’ve been here since 6 a.m.; I have to vote,” she shouted at one election worker, then another. Eventually, a young woman guided Ms. Lubin to a room with names taped up outside. It included several other Lubins, but Sultane Lubin’s name could not be found. She turned to a police officer for help. “I’m just here for security,” the officer said. Even she, however, would not identify her selected candidate. 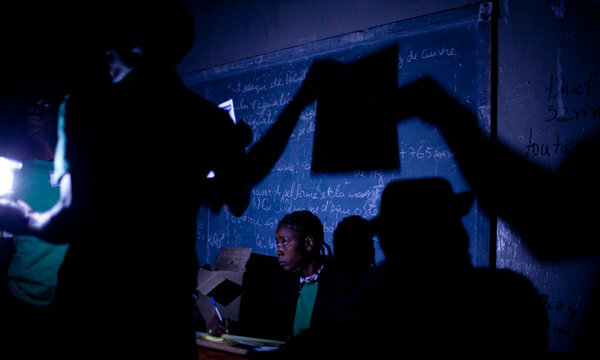 Political intimidation has scarred many in Haiti, and with party observers outnumbering voters at many polling sites, the most forthcoming citizens would only speak in code: about voting for “the young one” (Mr. Martelly); or “my wife” (Mirlande Manigat, a constitutional scholar seeking to become the first woman elected to lead Haiti). Jeantil Laguerre, 39, echoed many voters who said they were most concerned about corruption. Whoever wins the presidency will oversee billions of dollars in post-earthquake reconstruction. Mr. Laguerre said that explained his support for Ms. Manigat. The potential for transformation is enormous, but it will require a degree of institutional change that many Haitians fear may never come. Candidates were not the only ones complaining about potential fraud. Voters and campaign workers also said they feared that Mr. Préval’s Unity Party was trying to engineer a victory for Mr. Célestin, whose green posters had long outnumbered those of other candidates throughout the city — suggesting financial support from the government.